What does a true, committed relationship with Jesus look like day-in, day-out? The book of James is all about what it really means to be a Christ-follower in some key areas that people who are not all that serious about following Him often don’t take seriously. Big Idea: Dealing with temptation is a serious thing: we all regularly face temptations to do things that are destructive and wrong. God wants to help us learn to deal with our temptations by knowing when we are being tempted and turning to Him to deal with them. Big Idea: Serious faith means being serious about obedience. Lots of people consider themselves “spiritual”, but not nearly as many approach God’s Word with a mindset and commitment to obedience. Lots of people have “faith without works”, i.e., believing stuff but not being changed at all by what they believe. Big Idea: Serious faith means serious change in how we talk, especially to and about people. Almost everyone struggles with saying hurtful or harmful things or just plain wrong things; nothing in most of our lives is harder to control and bring under obedience to God than our words. Big Idea: Serious Christ-followers are called to be people who pray big, bold prayers as a regular part of their lives. God can do enormous things through the simple thing called prayer. Prayer is an everyday thing, and it is not just “something you do” if you’re religious: it’s something with far more enormous potential than we often realize or utilize. 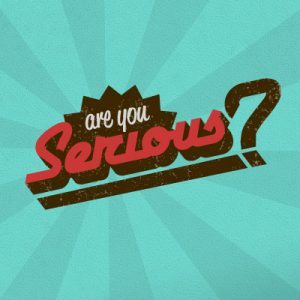 Be the first to review “Are You Serious? – Everything We Make” Click here to cancel reply.